The Armchair Adventurer: Nordseter: Back in the world. Nordseter: Back in the world. Once again I'm bathing in the afterglow of a wonderful trip. Sitting here in shirt sleeves with a hot drink and warm feet Norway seems a million miles away. It's great to be back with my family but right now I'm just trying to keep the trip alive a little longer, sorting out gear, downloading photos and collecting my thoughts. It'll be a little while yet before I get around to sharing the experience. In the meantime keep an eye on the Flicker slide show in the side bar and feel free to take a look at my photostream as new uploads appear (there'll be too many since, when it comes to photos, I can never make choices). By the way, I should realy stop refering to the trip as "Nordseter". As it happens we didn't get anywhere near Nordseter. More on that later. Welcome back Dave, great photos. Looking forward to the report! Nice photies, and I too am looking forward to reading about your adventure! 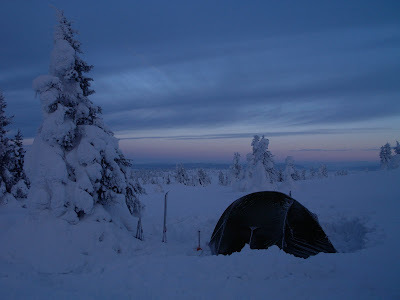 Great photo of your very snowy camp there Dave, look forward to reading the write up. Can't wait for the write up. Must have been a good trip if you are still enjoying it. Ben, Sorry missed this comment. Yes it was a good trip and teh reports on it's way. I've never had a bad trip yet. Perhaps thats luck but I rather think it's to do with the fact that good and bad come and go at a higher frequency than the duration of a trip. Every trip has good bits and bad bits. The weather is rarely so stable that its all plain sailing. When you're out in the elements doing physical stuff over the course of a few days you're bound to experience at least one dip. When I look back at my trips they all seem great. Perhaps we tend to remember the good bits more clearly? Perhaps, from the comfort of your living room, even the bad bits seem good? I suspect even that the bad bits tend to become the best memories given time? I think the bad bits are remebered as difficulties that you got though one way or another and as you say the good bits take on an extra shine looking back on them. It is one of the reasons I kept a journal of my trips and why I like reading about other peoples inspiring trips.